In most yoga classes that I’ve taken lately, there is usually a point early in the class where the class is invited to set a dedication or intention for their hour on the mat. I’ve usually leaned toward using “dedication” because I preferred the notion of thinking of someone or something that could use some healing thoughts; it’s a form of prayer. The first object that usually comes to mind is someone, anyone, who is going through a rough time. I think maybe once it was myself. However, just yesterday, I chose an intention for myself, instead. A plan, or an aim, this “intention” means, in the yoga context. Is there something I want to focus on, in particular, during this hour? I set an intention to be like a certain plant in my garden. In the morning I had been doing some yard work, and I’d taken a good look at a new plant that is in the yard this year (it’s pictured here, in the foreground). 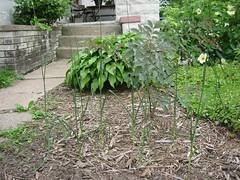 Last fall I planted the new bulbs for a strange variety of allium, or onion plant. It hasn’t yet bloomed, but the greens and buds that are presenting themselves are unique in the garden: anthropomorphic (in a Giacometti sort of way), graceful, and frozen in a strange sort of dance. It’s stalk and leaves are very long and thin, and many of the leaves cannot bear their own weight, so they bend, like limbs.The buds are so tiny that I barely noticed them when they finally appeared. What ensued, in the yoga practice: in various upright poses in the class, I felt even more elegant and elongated than usual, and more grounded though my feet, In some transitions, my movements had a more delicate, refined quality than I have ever perceived in my own body. It was a fun experiment, and I felt wonderful, after the class, perhaps due to the intention I set. I am wondering, also, if this experience can shed some light on my recent reading, in Stephen Cope’s “Yoga and the Quest for the True Self.” I’ve been trying to wrap my mind around the “divine play of opposites” in yoga: the stillness and straight consciousness of shiva, versus the dance and pure elemental energy of shakti. Yoga practice, and enlightenment, is evidently about cultivating balance between them. One can’t be, without the other. They are distinct. One analogy presented was helpful to me: “Brahman (shiva) and shakti are like the snake and its smoothing flowing motion.” One is a name, formalizing an existence; the other is descriptive of its particular energy. Allium is named allium, but without its unique leaves, stalk and bud, and without its movement and change over time, it would be nothing. There would be nothing. By studying, then mimicking those onions, do I have a better understanding of this plant? Of other things, in this life? There’s food (onions) for thought.